On May 29th, leave your sanity at the door and face the blood-spattered netherworlds of inscrutability that only Lucio Fulci, Bruno Mattei, and Claudio Fragasso can inflict. SHOCKING DARK (a.k.a. TERMINATOR 2), ZOMBIE 3 and ZOMBIE 4 are coming to home video from Severin Films with brand new 2k scans that will make your eyeballs explode! SHOCKING DARK: For director Bruno Mattei (VIOLENCE IN A WOMEN’S PRISON) and co-writers Claudio Fragasso & Rossella Drudi (TROLL 2), their final – and most notorious – collaboration went beyond brazen plagiarism to become a fearless act of deranged genius: In this bravura rip-off of both ALIENS and TERMINATOR, a team of badass marines, a tough female civilian and an orphaned girl battle monsters beneath the Venice canals while being chased by an indestructible killer cyborg. 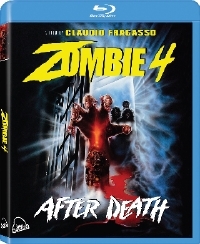 Limited Edition Available with Highly Unofficial Slip Cover with original Italian release art (and title) exclusively from the Severin-Films webstore. ZOMBIE 3: Shortly before completing the sequel to his classic ZOMBIE, the legendary Lucio Fulci became ill and left the Philippines-based production. But when director Bruno Mattei (SHOCKING DARK) and writers Claudio Fragasso & Rossella Drudi (TROLL 2) stepped in to finish, the result became the most “insanely enjoyable” (The Lucid Nightmare) zombie romp in EuroCult history. After a deadly virus is stolen from a government facility, it will unleash a “wildly entertaining” (Realm Of Horror) combination of Fulci’s signature extreme violence, Mattei/Fragasso-style surreal logic, and big bloody buckets of goo-spewing mayhem that must be seen to be believed. Deran Sarafian, Beatrice Ring (INTERZONE) and Massimo Vanni (RATS: NIGHT OF TERROR) star in this “total blast” (Bloody Disgusting), now featuring a an uncut 2k scan for the first time ever in America. ZOMBIE 4 – AFTER DEATH: In between the celebrated insanities of ZOMBIE 3 and TROLL 2, director Claudio Fragasso (here under the name ‘Clyde Anderson’) and writer/collaborator Rossella Drudi put the penultimate batsh*t nail in the coffin of the legendary ZOMBIE series: When a white scientist’s cure for cancer enrages an island voodoo priest, it will unleash the ultimate plague of ninja zombies, exploding heads, eye-gouging, face-ripping, power ballads and big bloody mouthfuls of flesh-chomping havoc... and that’s just the first 20 minutes.